It was late winter and the sun was just starting to come up over the rolling wheat fields in Eastern Washington. My buddy and I hiked out to some of our favorite coyote hunting grounds and set up the Foxpro. We picked comfortable spots in some tall grass, sat down, and I turned on the call. After just a couple minutes, Rob excitedly says “look over on that far ridge!”. I turned slightly and spotted two coyotes sitting WAY out there in a stubble field. I hit them with the SIG SAUER KILO2000 rangefinder. Instantly I get a reading of 1105 yards. I tell Rob the distance and change the sound on the call to entice them. They both start running toward us. As soon as they are behind the ridge, we adjust our positions and get ready. As the coyotes crest the hill on a run, I have the KILO2000 up. I hold the button down so I can scan as they close the distance. 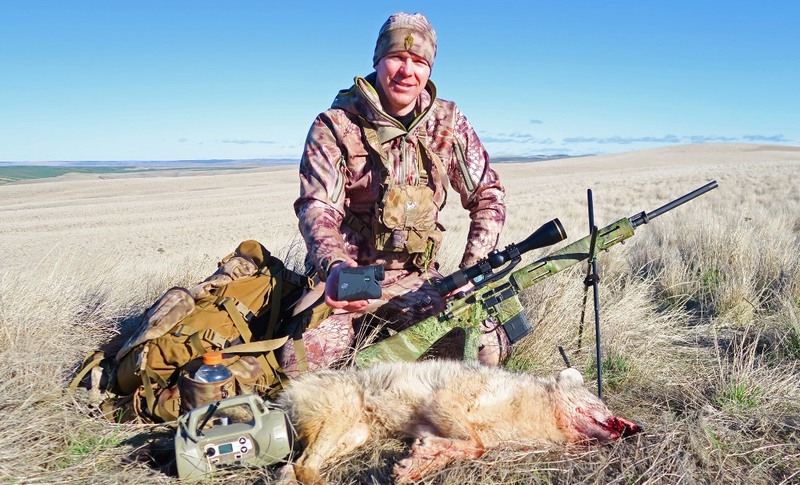 I tell Rob, “650, 600, 550…” until they are under 200 yards, well within range of our coyote rifles. I tracked my dog in the crosshairs as I applied some faint pressure to the trigger. At the report, Rob’s dog switched ends but never offered a shot before he was out of range. I had my dog and quickly realized how fast the KILO2000 updated the range as the coyotes were running toward us. Test number one, passed! I started hunting when I was very young, and remember the days sitting in my grandpa’s gun shop listening to stories of hunters saying things like “the buck was at least 1000 yards, so I aimed over his antlers” or “I guessed the bull at 30 yards, and my arrow went right under him”. 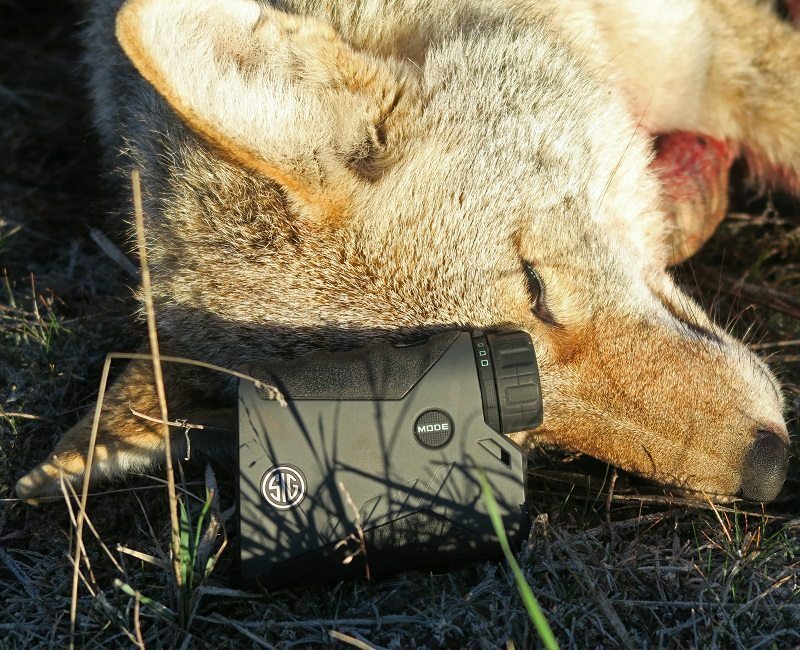 I bet most of us have heard those kinds of stories but less so now days as most hunters use rangefinders. 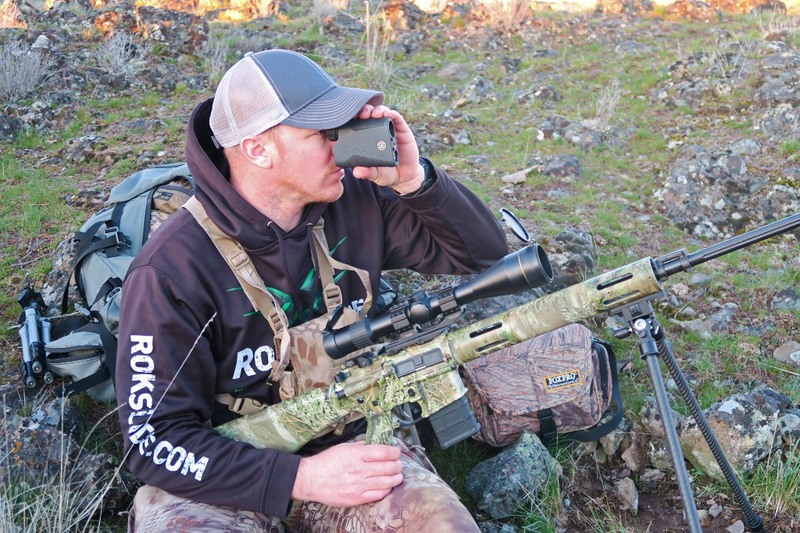 Yes, we still miss from time to time, but rangefinders have helped us take one of the variables out of the accuracy equation. 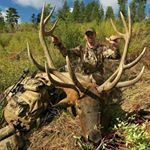 Like a lot of hunters these days, I try to maximize my opportunity and time in the field by hunting with not only my rifle, but with bow and muzzleloader as well. Because of this, I need a rangefinder that works well from five yards to 1000 yards, and beyond. The rangefinders that I have used always seemed to be lacking somewhere. They either had an insufficient maximum range, or wouldn’t give angle compensation below a certain yardage. Because of that, I have been forced to use different rangefinders for different types of hunting. This always seemed needless and sometimes meant I had the wrong tool for the job. I visited the Las Vegas SHOT SHOW in January, 2016 along with some other members of the Rokslide staff. We stopped by the SIG SAUER booth and met Jack Gavin. He explained to us how SIG SAUER has taken a serious new direction in their line of electro-optics. They’ve assembled a new team of optical experts from around the world with the goal of taking optics and electronics to new heights, inspired by military design while using the latest in high-definition glass and electronics. 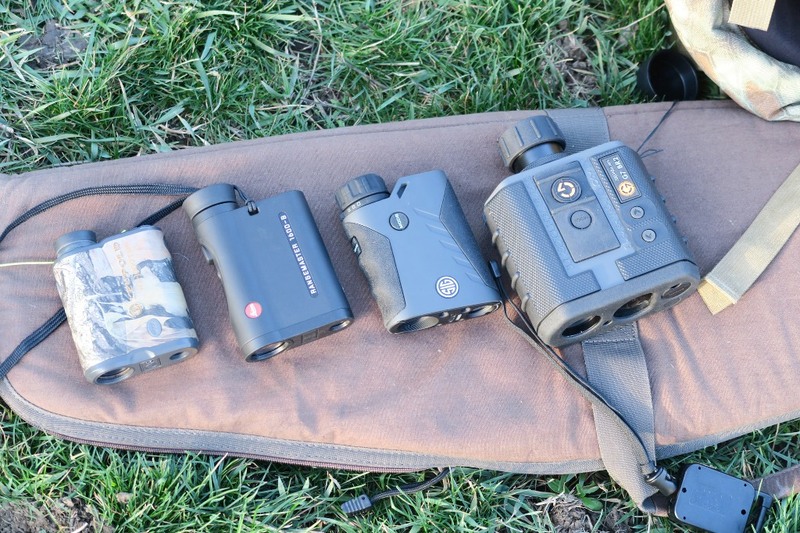 While we looked at many of their new products from scopes to binocular to spotters, their signature rangefinder—the KILO2000—was what really interested me. 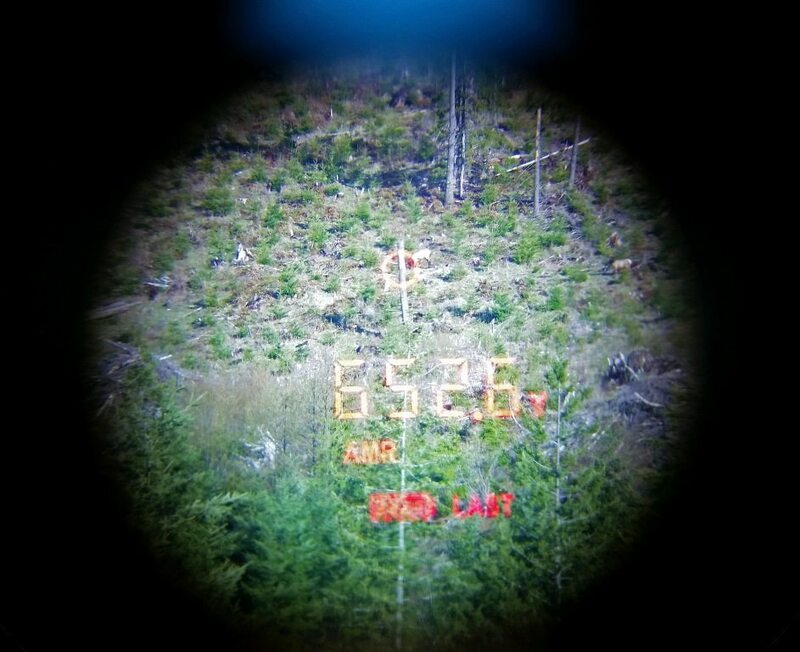 Although the Sands Expo is not the place to evaluate optics, I could tell this rangefinder was fast, really fast, compared to the ones I’d used and the optical clarity seemed to be great. Jack explained that the KILO2000 uses a technology that updates the yardage four times per second while keeping the readout display as simple as possible. The display automatically adjusts to ambient light so it’s bright in bright light, but dims as the light fades. I left the booth wondering if the KILO2000 would work for all my hunting scenarios? Just a month later, Robby, Rokslide’s editor, put out the call for a Rokslide staff member to test the KILO2000 in field conditions. I had my hand up faster than a laser beam and was feeling pretty good when Robby handed me the project. I was going to get to answer my own question. Jack Gavin had the rangefinder on my doorstep in just a few days. In the box I found the manual, protective case, lanyard, rangefinder, and battery. 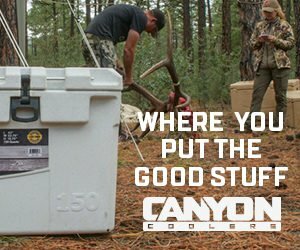 I started using the KILO2000 right way in preparation for the upcoming coyote hunt. I found the lanyard was comfortable on my neck, and seems to be good quality. The case has a belt loop, which attached easily to my bino harness. It also has a shock cord closure that is quiet to open and close. 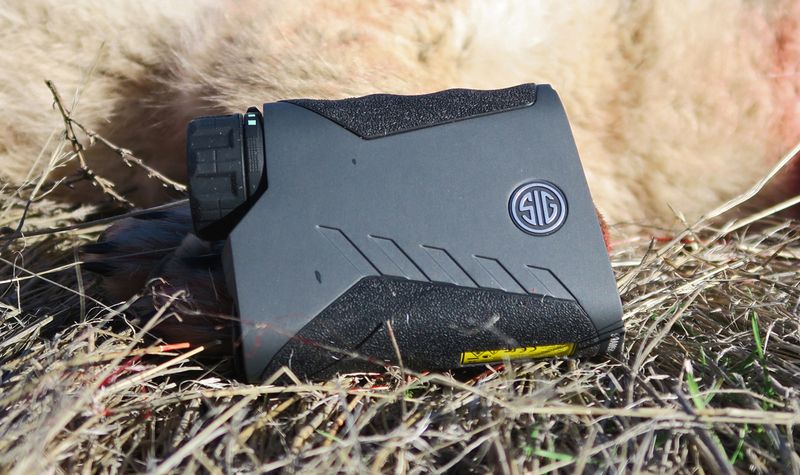 You could easily slip the rangefinder into a cargo pocket as well, if that is your preference. I found the size, and shape fit my hand well, and the button location makes it easy to use with either left or right hand. The top and bottom have a nice rubber coating for good grip. The rubber also quiets the noise if you bump it on your weapon or a rock, but the sides will make a bit of noise if you bump it there. The KILO2000 weighs 7.7 oz with battery installed. The focus band is located at the base of the eyepiece, and is a little stiff to turn, but it stays where you set it. The KILO2000 also features a “twist up” eye cup, which allows use with or without glasses. With more use, I was starting to realize that SIG SAUER did a great job, making a simple, easy to use rangefinder without a bunch of bells and whistles. The KILO2000 has two basic modes: Line of Site, and Angle Modified Range (AMR). Line of Site mode displays the range to target, with the angle displayed to the side. AMR mode calculates the line of site and the angle, then displays the horizontal equivalent range. 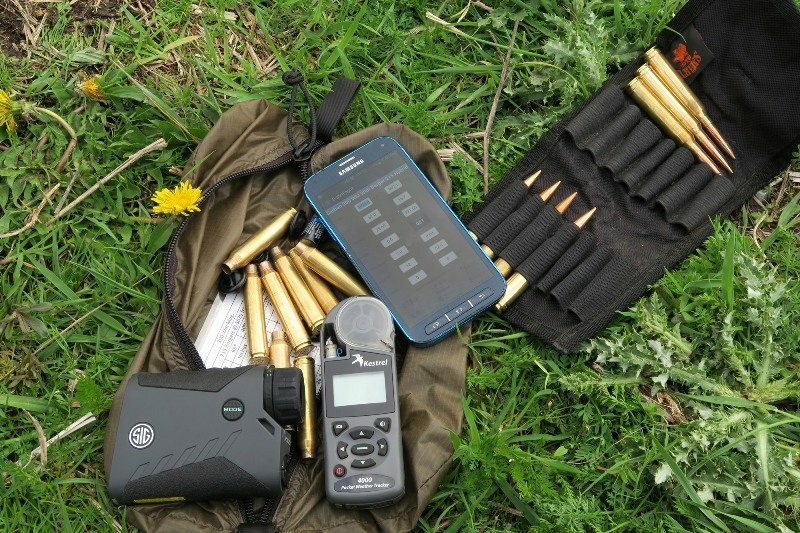 The KILO2000 also has a HyperScan mode which scans targets at 4x per second while you hold the button down and displays the last target when you release. It also has best/last target options, and manual or automatic display brightness. 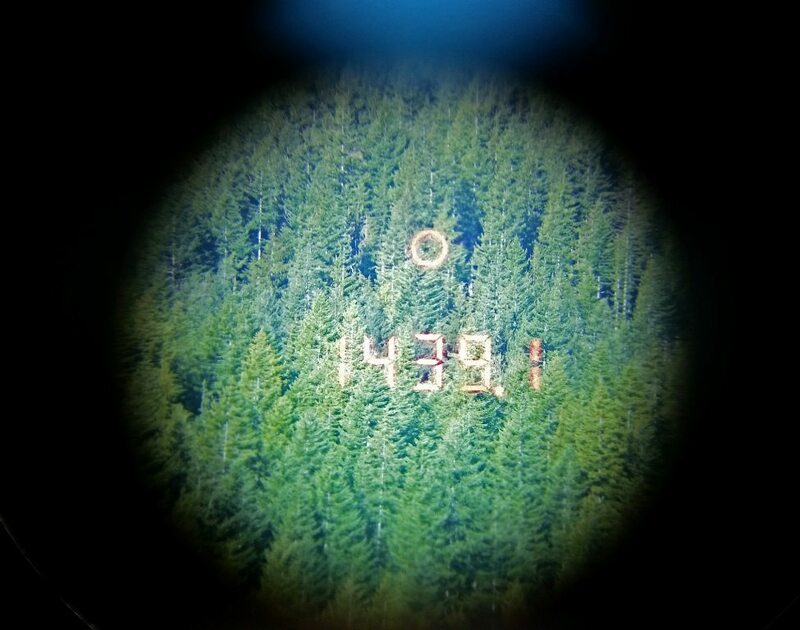 The max ranges for the KILO2000 are 3,400 yards reflective, 1,500 yards on trees, and 1,200 yards on deer according to the manual, and after testing, I would say those are pretty good numbers. For this review, I compared the KILO2000 to the Vortex Ranger 1000 (not pictured), Leupold 1000 TBR, Leica 1600B, and the G7 BR2. The Vortex, and the Leupold have some great built in features, but aren’t even close to the same class as the SIG SAUER when it comes to max range and speed. At around $499, The SIG SAUER does cost a bit more than the Vortex and Leupold so I expected more out of it, and wasn’t disappointed. The Leica and G7 are geared more towards long range shooting and hunting, and both cost more than the SIG SAUER, especially the G7 at over three times the cost. For that price you do get a unit that gives you all the information required to make a long range shot, except for wind speed and direction. While not having the plethora of features the G7 had, the KILO2000 was faster, and ranged farther consistently. The Leica 1600B, at around $800 is much closer to the SIG SAUER in price and ability, but giving the shooter temperature and pressure. The Leica however doesn’t give angle compensation below 100 yards which hinders it for archery and muzzleloader use. With the KILO2000, I was able to range and get angle comp under five yards without a problem. I tested the unit in all types of terrain and conditions, and each time it would beat the G7, and match the Leica for max range. One of the toughest conditions for a rangefinder is bright sunshine. On a very sunny morning I had the KILO2000 up in the mountains for some max range testing. On trees and brush I was able to get readings in the 1,200-1,300 yard range every time I pressed the button. As I got closer to the max of 1,500 yards, I had more difficulty getting a reading, but again, this was in bright morning sunlight. Later, I spotted some elk feeding in a sunny clear cut. I pressed the button, and got an instant reading every time at 652.4 yards. I also spotted a doe feeding a little further. Click, range, click, range—821.7 every time. I didn’t play around with the reflective max as much, but was able to hit just under 3200 yards on a big highway sign way down the valley. I only had a couple of complaints with the KILO2000. The first one was the larger size of the aiming circle. I would much rather see a fine cross hair, or much smaller circle. The second one was readouts to the tenth of a yard. This isn’t a really big deal, but it can make the reading confusing, and is totally needless in my opinion. With the quality glass and 7x magnification, I found that I could see animals very well, and the field of view was great. I wouldn’t hesitate to drop my binos and use only the KILO2000 for glassing as I closed the distance on a bedded buck with my bow. The KILO2000 also sports a five year warranty on the electronics and a lifetime warranty on the optics. 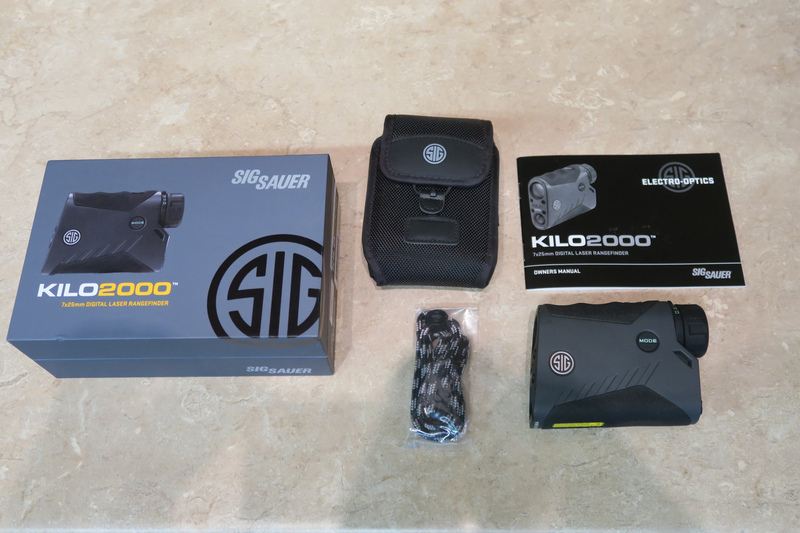 Overall, the SIG SAUER KILO2000 is a great rangefinder for the money, and versatile enough that I can use it for all of my hunting and shooting needs. Great job SIG SAUER!